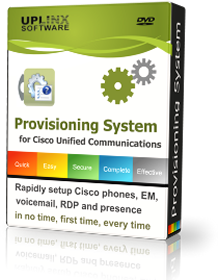 With the UPLINX Provisioning System, an Enterprise can now easily extend any existing Enterprise Configuration Management (ECM) to include provisioning of end users into their Cisco Telephony system. The Uplinx Provisioning System API and configuration platform offers a working API which allows submitting complex and complete provisioning operations within hours from any existing CMDB or ticketing systems. Other solutions require weeks or even months of software developer work for basic commissioning tasks and require a detailed understanding of the published Cisco internal APIs as well as laborious configuration and testing. By utilizing the Uplinx Provisioning system API, once users are provisioned in Microsoft Active Directory, one simple call to the Uplinx Provisioning System API can add, update or delete all end user related objects on all involved servers. The required templates and logic are easily configured on the Uplinx Provisioning System web interface and within hours an integrated system will be operational.